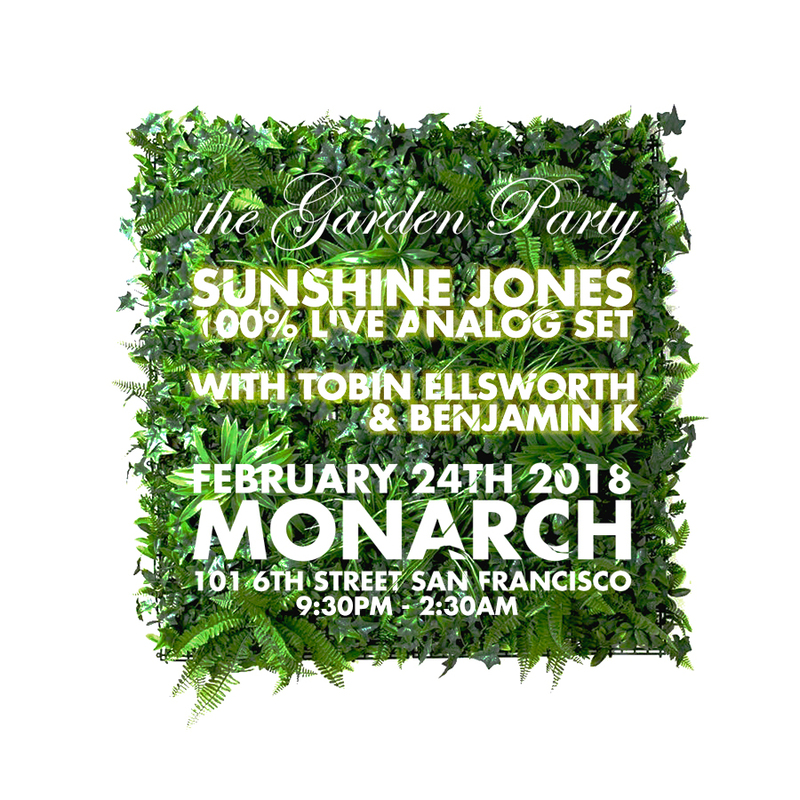 On February 24th we are going to deck out the basement of Monarch with flowers and plants and convert that beautiful basement into the Garden Party! I will be playing a 100% live set, and Tobin Ellsworth, and Benjamin K will be mixing on the decks. I love playing at home, and this is going to be amazing! Super excited for your show tonite… Thanks for bringing it!!! So excited for Sat night! Yaaay!!!! This will be fun. You already know I’ll be there front and center! Hopefully Justin OBrien will join me ♥ ♥ ♥ Disco Soldiers for life!!!! Well that was pretty amazing, right? It was such a treat to totally indulge myself without limits or concerns. New songs, loads of inspiration, cheers, screams, and after 2 am it only seemed to get better and better right up to the end. Just outta sight. Thank you. Tobin Ellsworth and Benjamin K. McCarthy were so good, and so deep, and everyone at the garden party was so lovely. Emily White , Corbin Sorensen , Erich Bowman , Sarah Mccombs , Brent Northey , Adam Landsdorf and Poroschat, Deno Vichas , two big beautiful bears, a person in dinosaur pajamas, and I even heard that Kate A. Cleaves made the scene, but I didn’t get to see for myself, a radiant eyed singer was accompanying me and working it out as my choir first from somewhere nearby and then front and center, gear guys were freaking out and discussing my process, dancers were dancing, everyone was smiling and we just lifted that basement garden up into space last night. I LOVED it. Let’s do that again!!! So good to hear my Juno, Jupiter, and JX again together. The Roland SH-01A served as perfect bass, a fantastic impromptu sequencer, and a brilliant heady lead for the trippy melody in All We Are, and the modular… Perfection. Dirtbike really happened. A sub pulse, with two mid pulses throbbing and I was messing with the phase and we could hear and feel every bit of it. A splendid show at home, and I love playing at home. That was so magical!! Sorry didn’t get to say hi we went up to see you but you were deep in your creative vortex! Xxxooo thanks for the beauty! Thank you for the amazing set last night. It was wonderful and beyond the music itself, you created an experience. Keep spreading positivity and doing what you love. We appreciate you. I had a blast, thanks for elevating the moment! Sunshine Jones you are a goddamn, national treasure… and destroyed Monarch tonight with a 2+ hour live set, free of any laptops or computers. Haven’t seen a set that inspiring and moving, in quite a long time. House Music All Night Long, indeed! What an awesome show! When I walked down there, I was like.. Ohhh man… small basement, low ceilings, sound is going to be horrible.. Holy hell was I wrong! What a sound system that place has! Loud as hell, but so clear you could still (almost) have a conversation. And your set… By having the level of control over sound that a DJ can never had, you played the crowd/dancers as much as you played the machines. Amazing job! Much love! @ Drümünkey – Well, I agree… I love a basement. I was totally born in a basement. But in addition to the wonderful sound in that club, the real treat was the sound tech Tyler Jurich who brought down a Neve summing mixer, and his 500 series lunchbox with a compressor and eq for adding a little glue, and refining the sound just ever so slightly enough to make that totally happen just right. I’ve played hundreds of shows now in this basic configuration, but I’ve never before been able to play with the phase of pulse waves with that degree of imaging clarity and pure joy. Dirtbike was just amazing… that was the crazy repeating baseline track that shook the foundations of the club about 2/3 of the way though… I just reveled in playing those waves off one another, and I could absolutely hear everything as it was happening every bit as much for me as it was for you. I rarely send thank you letters to sound people, but you better believe I sent a warm, loving thank you almost as soon as I got home…. SO glad to see you, and so happy you were there.